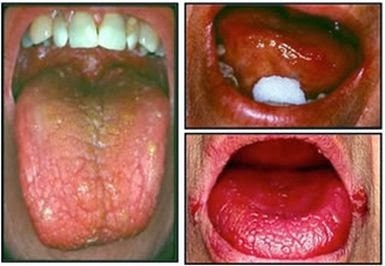 Burning mouth syndrome (BMS) is an enigmatic condition because the intensity of symptoms rarely corresponds to the clinical signs of the disease. Symptoms include oral burning, dry mouth, pain, changes in eating habits, severe menopausal symptoms, and non specific health problems etc. BMS is most prevalent in postmenopausal women with female: male ratio of 7:1. The etiology of BMS is multifactorial such as hormonal changes (menopause), nutritional deficiencies and taste disturbances to name a few. BMS is a challenge to diagnose and manage. The present article discusses some of the recent understanding of etiopathogenesis of BMS as well as the role of pharmacotherapeutic management in this disorder.